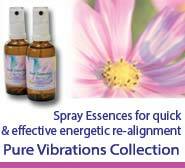 We are now offering a complete set of all ten of the Pure Vibrations Collection Essence Sprays. These beautiful Essence Sprays are designed specifically to provide the instant energetic support that can help you maintain positive vibrational alignment no matter what challenges you face in life. Please note that there is no box with this set.